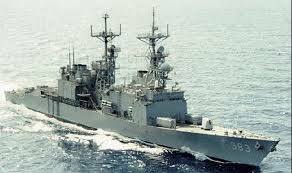 During the Haiti crisis in the mid-90’s, I was a young sailor on watch. It was a calm, quiet, typical Caribbean sunny day and we were just off the coast of Hispaniola in the Windward Passage. Punching holes in the ocean, is what we called it, squaring off the edges of our station with slow, lumbering turns to starboard. Our job was to search for Haitian refugees trying to flee, and blockade runners trying to enter thru the straits that led to Port-au-Prince Bay. As we slowly turned along one of the invisible lines of our box, something went wrong deep in the belly of our destroyer. The 21MC speaker crackled as the Engineering Officer of the Watch called up what was plainly obvious: we had lost main propulsion. A half a second later the captain was on the bridge. Fortunately, just as he began to spew questions we were back underway, but one of our gas turbine engines was destroyed. Without one of our main propulsion engines, our ship was instantly considered an operational casualty. Not fully understanding the cause, our number one objective was to get to a U.S. port facility before anything else could go wrong. I asked the Quartermaster for a bearing solution to Guantanamo Bay, Cuba and waited for a response. There was a brief pause before the captain turned to me with a quizzical look, waved his finger towards the port quarter and said: “Gitmo’s that way.” I took the hint, and promptly ordered a course in the general direction of Cuba. A few minutes later (this was before GPS-integrated navigation) the Quartermaster of the Watch provided an exact bearing and we adjusted to his calculations. My initial turn towards Cuba saved us precious time in a critical situation. I had been trained to carefully consider course changes. At 8,000 tons and a 42 foot draft, there was a lot to consider on a Spruance class destroyer, but that day I learned to make some of those calculations on the fly and act decisively instead of slowly and mechanically. It was a good lesson. During future at sea adventures my quick, almost instantaneous orders would make the difference in a number of operational exercises and two all out emergency situations. Similarly, in our personal financial lives, we know the general direction we need to go, but sometimes find ourselves steaming in the completely wrong direction. There is no need to wait for specific data, guidance, and calculations prior to taking sound, common sense action toward our financial goals. For example, it’s easy to put off a decision to buy life insurance because we don’t know how much we need. I regularly ask clients how much life insurance they THINK they need, and more often than not, it’s pretty close to what we calculate when we conduct our in-depth planning analysis. Other financial planning decisions are not as intuitive, but still lend themselves well to action. Young couples starting out in life should put SOMETHING away for retirement. It’s probably not critical to conduct a full retirement plan analysis so early, but anything they are able to invest puts them way ahead of where they would be otherwise. I think we could all stand to be a bit more action based in our financial planning. There is always time to make course corrections and we are less likely to run into shoal waters if the ship is generally pointed in the right direction. Contact me if you’re ready to get started or in need of a course correction. Life happens and even the best laid plans need adjustments to keep pace.